As mentioned in previous posts, I've created a gallery of my best wildflower photographs from this spring in the Smoky Mountains. In all, there are photographs of more than 40 different varieties of spring wildflowers in this four-page gallery. As I mentioned in May 21 post (see below), HikingintheSmokys.com has undergone several changes as a result of my week-long hiking trip in the Smoky Mountains. The most recent change is the addition of a short video clip showing highlights from our hike to Andrews Bald. You can see the video at the bottom of the trail report located here. As I also mentioned, I'm working on a wildflower gallery, showing the best Smoky Mountains wildflower photographs from this spring. I hope to have these pages posted in this blog by the end of this week. As mentioned in my previous post, HikingintheSmokys.com has undergone several changes over the last several days. We’ve added a 6 minute video showing highlights from our hike up Mount LeConte. You can check out the video, a few pictures, as well as the complete report by clicking here. As I mentioned, last week we returned from an eight-day hiking trip in the Smoky Mountains. In addition to the video, we have added detailed trip reports and pictures for the 13 trails we hiked, including Mount LeConte, Charlies Bunion, Andrews Bald, Alum Cave, Rich Mountain Loop as well as several other trails not as well known. During our trip we hiked over 56 miles and climbed over 11,400 feet. We were threatened with rain almost every day, but managed to dodge it for the most part. There was a particularly nasty storm that blew through the Smokies one night that dumped about 6 inches of marble-sized hail on top of Mount LeConte. We happened to hike this trail the day after. It made for some interesting hiking, especially around Alum Cave. We also saw a ton of wildflowers, which are posted throughout the new trail pages. Hopefully you liked the video and found it helpful. Please drop me note, I would love to hear your feedback as I will be posting more video over the next couple of days. Finally, stay tuned, I will be posting a comprehensive collection of wildflower photographs I’ve taken this spring. I’m not exactly sure how many varieties I have, but I expect there to be at least 25. You should see those photographs in this column within the next week or two. We just returned from a week-long trip in the Smoky Mountains. In the next few days you will see many changes to the site, including the addition of trail detail for 13 more trails. We'll also be adding video for a couple of trails as well. During our stay, we hiked several Smoky Mountains classics, as well as a couple of trails that may not be as well known to the casual hiker. During this trip I took nearly 400 pictures. I wanted to share a few to give you a taste of what's to come for the web site. There are roughly 900 miles of hiking trails in Great Smoky Mountains National Park. There’s also a lot of history underneath the trails we walk along today. How were these trails established? Who blazed them, and why? Some of the earliest trails in what would become the National Park were simple game trails created by migrating bison, elk, and other large animals. Many of these were adapted by the Indians in the area. The Cherokee used these established routes for trading with other tribes and for reaching favored hunting grounds. A few of these old settler roads eventually became the hiking trails we use today. If you hike along the Old Sugarlands Trail, the Little River Trail or the Miegs Mountain Trail, you will be walking on some of the same roads used by the pioneers and homesteaders of this area. Wiley Oakley, also known as the “Roamin Man of the Mountains”, was born in 1885 at the base of Mount LeConte. Tragically, his mother died when he was a young boy. To help deal with his grief, he began wandering the hollows and mountains near his home. Reflecting back as an older man, he spoke of how he would try to climb the highest peaks to see if he could catch a glimpse of her in heaven. Adams, an avid hiker, joined the Great Smoky Mountain Conservation Association in 1924. The association was a group dedicated to making the Smoky Mountains into a national park. Later that same year, Adams led an expedition to the top of Mount LeConte for the purpose of showing Washington dignitaries the rugged beauty of the Smoky Mountains and to help promote the cause for national park status. The delegation spent the night in a large tent. The following year Adams would build a cabin on that same spot which eventually led to the establishment of the LeConte Lodge. As we’ve seen, several of the hiking trails in the Smoky Mountains follow all or parts of the routes developed by migrating animals, Indians, pioneers and explorers, however, the majority of trails still in use today were developed by the Civilian Conservation Corps (CCC). Since the early days of the Park, various hiking clubs have worked to improve the original CCC trails, and in some cases, construct new ones. One of those trails, the granddaddy of all trails, is the Appalachian Trail. The Appalachian Trail, also known as the AT, runs for 70 miles through Smoky Mountains National Park, entering from the north at Davenport Gap and exiting in the south near Fontana Dam. The highest point anywhere along the 2158 mile trail is at Clingmans Dome (6625 ft.). The trail also passes by other notable landmarks in the Smokies such as Charlies Bunion, Rocky Top and Icewater Spring. Although the AT was the brainchild of Benton MacKaye, cofounder of The Wilderness Society, it was Harvey Broome and Paul Fink that made it a reality in the Smokies. Harvey Broome was an early environmentalist, another one of the cofounders of The Wilderness Society, and a longtime president of the Smoky Mountains Hiking Club. He, along with seven others, hiked the 70 miles of AT through the Park in 1932, before the trail was completed. He was largely responsible for sighting most of the AT thru the Park. Paul Fink, another leader of the movement that led to the founding of the Great Smoky Mountains National Park, was also instrumental in blazing the AT through the Smokies. 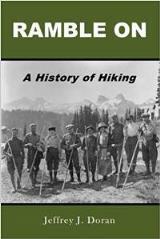 Fink was a member of the Board of Managers of the Appalachian Trail from 1925 to 1949 and was the author of “Backpacking Was the Only Way”, an account of early 20th century camping and backpacking adventures in the southern Appalachians. Over the years, the Park has closed certain trails for various reasons. In the future, it’s likely that other trails will be closed and new ones will be created, demonstrating that the Park isn’t static, but is a Park that continues to evolve.